French Fries and Ice Cream and Prizes, Oh My! | Favorite Foods, Inc.
French Fries and Ice Cream and Prizes, Oh My! Home / News & Events / French Fries and Ice Cream and Prizes, Oh My! Once again we are coming close to the annual New Item Marketplace at Favorite Foods. This is the day we invite our customers to come together for the opportunity to sample and learn about the current and new foods offered by our supplier partners. Our suppliers will also be at the show to make the most of our customers’ experience. Our vendors include famous names you’ve loved for years, and our customer base is the entrepreneurial, independent restaurant right down the street. We bring these groups together for what has become our most popular event of the year. The New Item Marketplace is our customers’ chance to ensure their menu is going to include the tastiest, newest, and even cost saving products that follow the trends of the market. It’s one thing to see a photo on our website or read a description of the items our vendors supply, but the annual food show grants our customers the ability to see and taste why they need these new items on their plates and how they can use them to bring their menus to the next level. At the food show, our customers can learn how to best prepare the foods, what to pair them with, and what the benefit of offering it to their local customer base will be. Since the arrival of the new year, our team has been preparing for the April 5th show that is set to be held at the Regatta Room in Eliot, Maine from 10pm-4pm. This amply spaced room is the perfect spot for our vendors to come and prepare their must-have items that are going to be hot as we head into the Spring season. The Spring and Summer months are the time where our customers’ kitchens flourish as they are the best time to dine on seacoast. Our customers are located far beyond the coast as well, but New Hampshire and Maine, as we know, are always busiest in these months after we slide out of our winter hibernation and and out into the world. It is also the time that outsiders travel to the beautiful New England scene, which means even fuller tables and the chance to convince them that our restaurants are the best. And they come back each year! Of course we always have a theme, and this year we are bringing alive a classic by celebrating the 75th Anniversary of the Wizard of Oz. If you’re like us, this tale was your favorite to grow up watching, and so we are bringing it to you with your favorite foods. Besides being able to try delicious and new menu items, customers can win one of four awesome prizes at the food show. Our prizes this year include a mini black Keurig with two Wizard of Oz themed mugs, four Wizard of Oz figurine dolls, two tickets to Wizard of Oz: The Musical in Boston on April 20th, and finally the 75th Anniversary Wizard of Oz Monopoly game. Our team is excited to be able to once again bring together our customers and vendors a provide the opportunity to expand and liven up their menus. 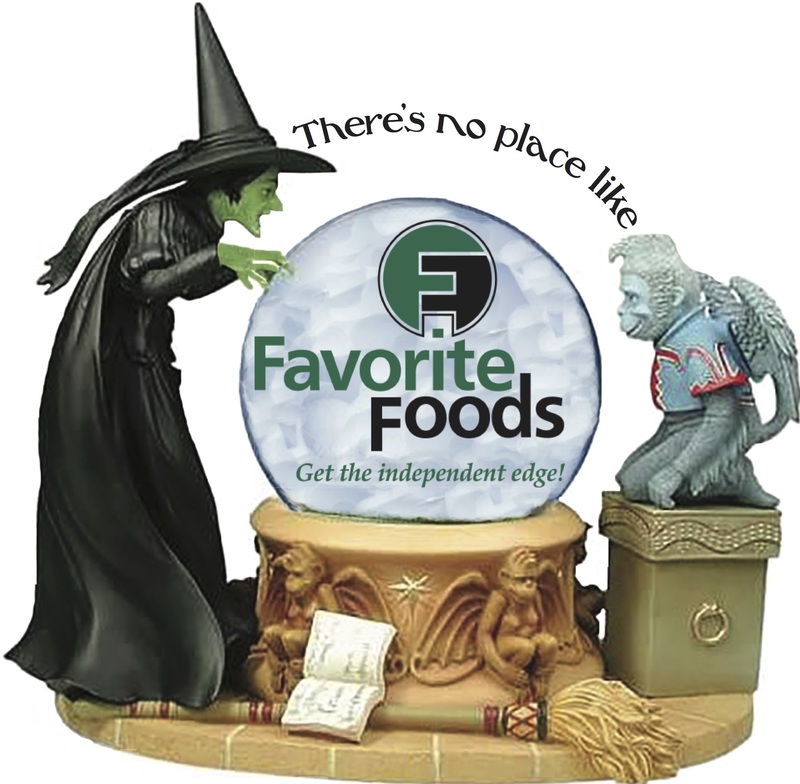 We can’t wait to share with the coast and beyond what Favorite Foods has to offer! Make sure to like us on Facebook and follow us on Twitter for updates and info!